Just finished a 9 x 12 portrait of the steeplechase horse “Fog Island”, owned and trained by Maryland horsewoman, Michelle Sanger. Last year at the Iroquois it was exciting to cheer this beautiful horse on as he raced on to win The George Sloan and John Sloan Sr. Sport of Kings Maiden Hurdle race at Percy Warner Park here in Nashville on a rainy and overcast Iroquois Day. 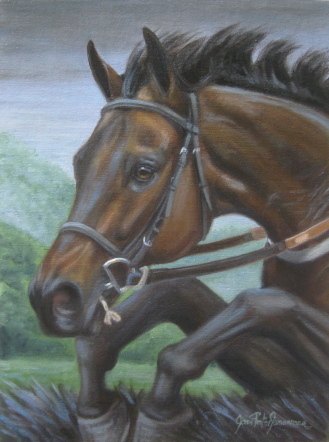 Ms. Sanger also owns a portrait of another one of her horses “Birthday Beau”. I hope to be able to cheer one of them on again this year!